DotA 6.75 Release Date Hinted! After the International 2.. I know most of you are craving for any news about DotA 6.75. 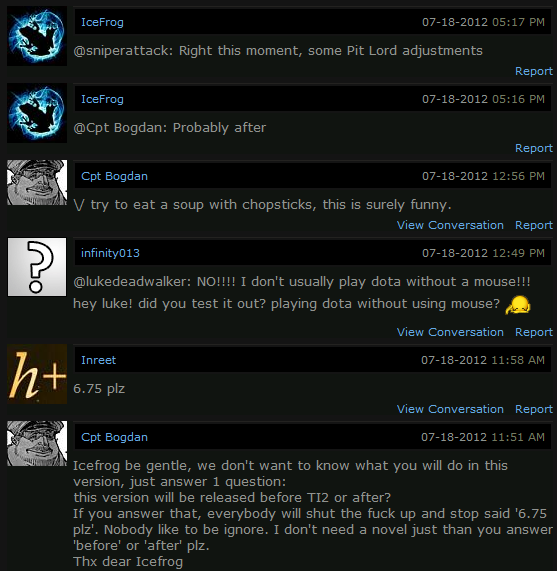 It's very natural since the information about DotA 6.75 is very scarce. And as you can see on the image above, IceFrog is hinted the released date of DotA 6.75 will be after the International 2 (the biggest Dota 2 Tournament with 1 Million USD Prize). If you are too lazy to clink the link above, the International 2 itself will be held on August 31 until September 2. Sigh.. That's still 1.5 months away. IceFrog also hinted that they are now working with some remakes on the Phoenix and Pitlord as this post cover it before. Moooooonster kilLLLLLLL! what date you release the version 75 ? Yang punya blog ini orang indo y? Where is "the international 2"? Hey Alief, your name similar to Javanese name. Are you Indonesian? GODLIKE! , is there a new heroes there?! :) can't wait !